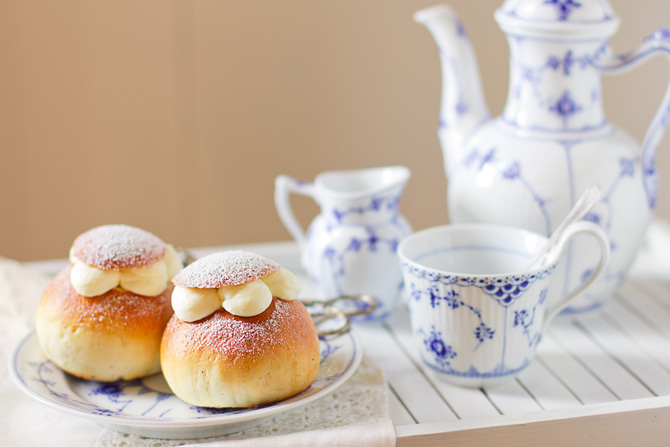 Yesterday was Shrove Tuesday and bakers all over the country (and all over the Nordic) were, and probably still are, whipping up fluffy lenten buns. I made my own this year. Two times even. The first version seemed to be too buttery and not airy enough. Wasn't happy with the shape either. After careful consideration and armed with a scientific approach, I tweaked the recipe to alter the structure of the bun. Second try resulted in perfectly round buns with a texture quite similar to the ones you'd get from shops or good bakeries. I do not consider it to be perfect, yet, but still very close. I prepared two different fillings. After quaffing them all down, most of the family expressed their preference for the classic marzipan. 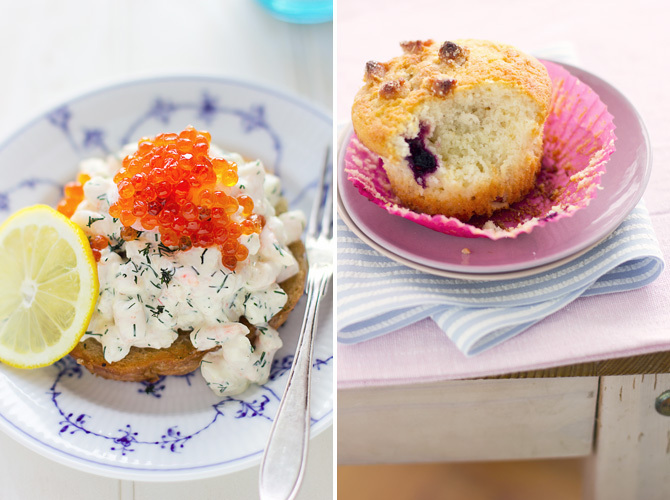 Toast Skagen (couldn't find löjrom!) and a muffin made of leftovers. Last week, during a casual trip to the small grocery store on the corner of the street, I found this darling bottle of milk. I couldn't have been more excited! Organic whole milk from Riido Farm, produced less than 8 km from our house. Cute as a button, too! Sieve flour into a bowl. 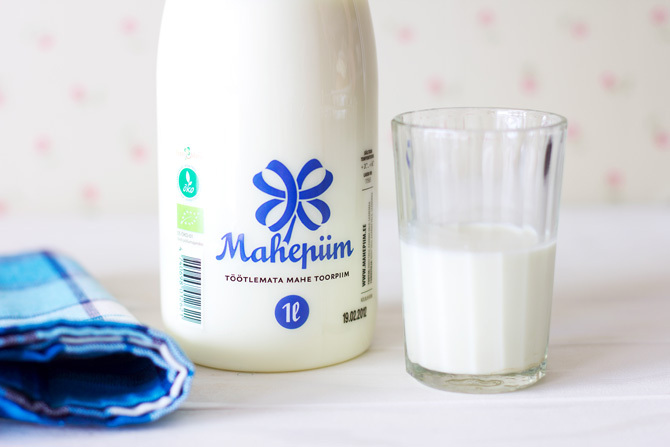 Heat milk to 38°C. Mix yeast with sugar and warm milk. Pour into the flour, add cardamom, salt, quail eggs and butter. Mix it all together and knead into a smooth dough. About 7 minutes with a machine or a bit longer by hand. Cover and let rise in a warm place for about 50 minutes. Divide the dough into nine equal pieces. Briefly kneading each piece between your palms, roll the bits of dough into beautiful spheres and place on a baking tray, leaving enough space between them. The buns will be double the size after rising and baking. Cover the tray and leave to rise in a warm place for 30-40 minutes. Preheat the oven to 210-220°C. 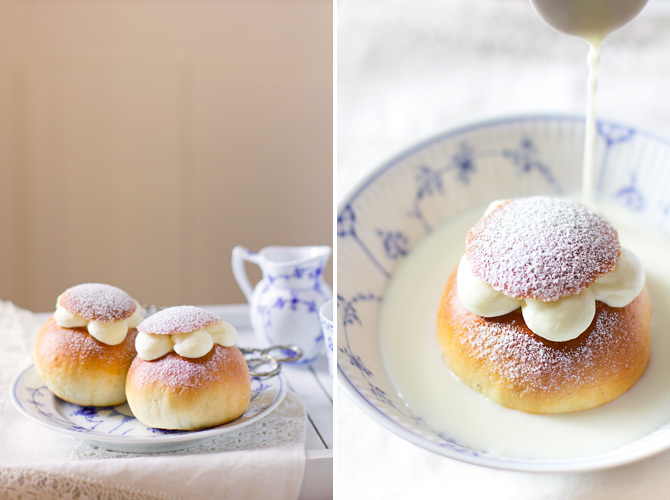 Brush the buns with sweetened milk and bake in the oven for 8 minutes. Do keep an eye on them as they will brown quickly. If the buns are not done after about eight minutes, then the oven is not hot enough. If the buns seem to get burnt then the oven is too hot. After removing the buns from the oven brush them again with sweetened milk. This prevents the crust on top from going too brittle or tough while cooling. Finely chop or grate marzipan into a bowl. Add three tablespoons of milk. With a serrated knife, cut the tops off the buns. Not too much, about half a centimetre is enough. Now dig a hole into each bun, removing a spoonful of crumb from each. Place half of the breadcrumbs into the bowl, discarding the rest. Using a fork, mash the marzipan and crumb mixture into a nice soft paste. Add a bit more milk if it is not soft enough, but it should not be runny. Use this marzipan paste to fill the cavities of the buns. Sweeten double cream with icing sugar, about two-three spoonfuls, and whisk until fluffy. Top filled buns with a good heaping of whipped cream and replace the bun caps on top. 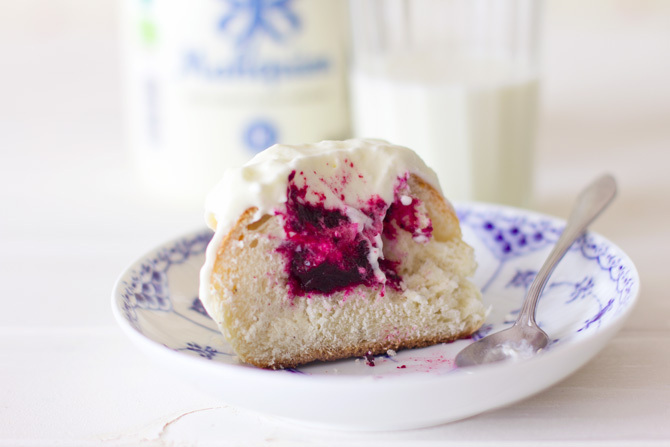 The most common alternative filling consists of whipped cream or curd cheese paste mixed with some sweet and sour jam, like cowberry, cranberry or blackcurrant. Serve alongside a steaming cup of coffee or on a deep plate, submerged in warm milk infused with vanilla. Oi, see piim on tõesti väga nunnu! Huvitav, kas seda pealinnas ka saab? Fantastic blog! I just came across it and it immediately became a favorite. You take gorgeous pictures and those buns look so yummy! Kas ma näen õigesti, et see piim on klaaspudelis? Thank you, Chiara and Salma! Ei näe :P tegelikult on plastpudel. Hea disaini pärast seda kohe tähele paningi, pärast lugesin, et siinsamas tehtud ka veel. Saadavuse kohta ei oska muud öelda kui, et Riido Talu on Saare Mahe ja Eesti Mahe liige, ehk siis võib küsida neist poodidest kus Eesti Mahe oma tooteid turustab. I am zapped. These are gorgeous, ever so beautiful! Kahju, ma juba lootsin, et on ka selliseid mahetootjaid, kes plastikpudelite kahjulikkusest miskit teavad. i cant seem to find recipes to all your post.. or is it just me?? Isabel, which ones can't you find? The blog goes back to 15th of May 2011, with a total of 29 posts to date. That's all. Eva, ma arvan, et see plastpudel vs klaaspudel pole nii mustvalge, et nad nüüd ainult teadmatusest plasti kasuks otsustasid. Mullegi meeldiks klaaspudel palju enam, aga kui talu on äri, siis peab vaatama ka kättesaadavust, hinda, kaalu ja muud sellist, mis meid just nii väga ei huvita. Imelikul kombel piimapudelit ei loeta taarapakendiks, seal jääb pakendi hind täielikult tootja ja/või kliendi kanda. Kui oleks nii, et pudelid läheksid tootjale tagasi uuesti täitmiseks, aga sel juhul on vaja miskeid steriliseerimisseadeid ja hulk transporti ja teab mida veel. They look great and so fluffy... I'm craving for one of that buns! Your blog is just making me speechless! Wow...! I made this yesterday, the buns wasn't the same as the one you saw in the shop! However, it taste the same. I will give another try, use your recipe above and see.. You did a good job.